A new way to electronically sign & complete offer letters, agreements, and more! Do you ever need to send an offer letter or a confidentially agreement to a new team member? What about sending a performance review to your team? Some companies started using Docusign to help keep track of everything. It was a bit pricey and employees would still have to fill out the same info (e.g. their name) on a bunch of different forms. But as of today, we have something even better for you: the new and improved GoCo Magic Docs! GoCo’s Magic Docs lets you digitally sign, complete, and track of all of your company’s HR documents in one place. The real magic comes in when the document is automatically filled in with all the data stored in GoCo! In other words, once the employee’s name is in the system, it will be automatically populated on all future relevant documents. Electronically signing documents is a breeze for employees. All companies get 2 Magic Doc templates for free. Additional Magic Docs require an upgrade to GoCo Premium. You can also now create a new Magic Doc template yourself in just minutes. Let’s show you how it works. First, add your existing HR documents to GoCo! 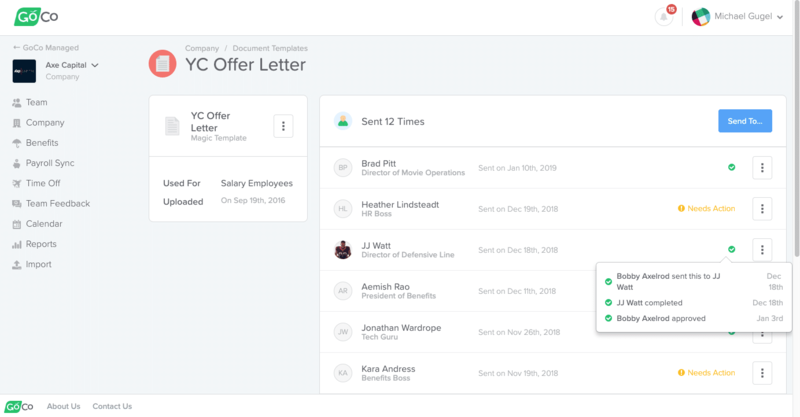 Simply upload your company’s existing Offer Letters, Agreements, Forms, and Performance Reviews and start instantly placing Magic Fields on your document. Each Magic Field will automatically fill in the existing GoCo information for each employee. It’s easy to add fields to your document. Have a complicated PDF or Word document? Not a problem! Just upload it and place text fields, dropdowns, and signatures fields in the spots where something needs to be filled in. You can also place checkboxes, radio lists on PDFs. When you’re ready, testing your new template is as easy as switching to the Test tab. You’ll get a live preview of what the sender and employees will see! Once your documents are turned into Magic Doc templates on GoCo, sending them is as easy as a few clicks. From the Documents page, simply click Send from the actions menu, choose who to send it to, fill in any missing information, and click send! You can choose one or more team members to send it to. The team members you sent it to will be asked to review and complete the document. You can even keep track of who has and hasn’t completed the document yet! GoCo will automatically fill in all the fields with the data already saved in the platform. No more filling in repeated information such as names, addresses, birthdays, etc. Any custom fields specific to the document can be filled in directly on GoCo. No more printing, scanning, and uploading — everything is 100% digital! Next Post →Share a benefits preview with your new-hire candidates!